Checkline DT-105A & DT-107A Contact Tachometer with LED Display Reliability Direct, Inc. Your Direct Source for Reliability, Maintenance, Test & Measurement! 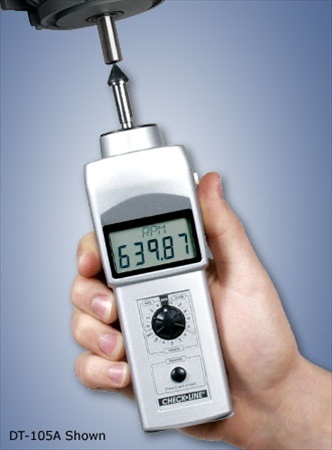 Accurately measure rotational and surface speed, as well as length. Built-in selector switch permits the user to display readings in a wide variety of engineering units. The DT-107A-12 includes a 12" circumference measuring wheel which is offered for safer and easier surface speed measurement by keeping the users hand farther from the moving surface and slowing down the rotational speed. All models are supplied as a complete kit including a 6" circumference surface speed wheel, two cone tip adapters, funnel tip adapter, shaft extension, two AA batteries and an operating instruction manual - all supplied in a foam-fitted carrying case. Accessories Included 2 Cone adapters, 1 funnel adapter, 3-1/2" extension shaft, 1 surface speed wheel (6" circumference, carrying case, operating instructions.